SAO PAULO, Brazil, March 21, 2013 (ENS) – The 1,800 year old fossil of a blue whale found on Sao Paulo’s southern coast may help prevent the extinction of the blue whales that remain today after a century of commercial whaling. Last August, part of the whale’s skull was found by a local resident on a beach in the town of Iguape, about 100 miles south of Brazil’s largest city, Sao Paulo. After he discovered the bones, Ewerton Miranda de Souza contacted the Brazilian Society of Paleontology asking that the Laboratory of Stratigraphy and Paleontology at the Universidade Estadual Paulista, UNESP, assess and remove them. This week, the age of a bone sample was determined through examination by an American laboratory specializing in carbon 14 dating. The lab estimated the fossil to be between 1800 and 1900 years old. “We found bones of the spine and took the tympanic bulla, which is equivalent to the ear. This will allow me to identify the species with certainty,” explained Professor Francisco Buchmann, coordinator of the Laboratory of Stratigraphy and Paleontology. He identified the whale bones as being from the skeleton of a blue whale, Balaenoptera musculus. “I do not think it’s a blue whale, I’m sure it’s a blue whale,” Buchmann declared. 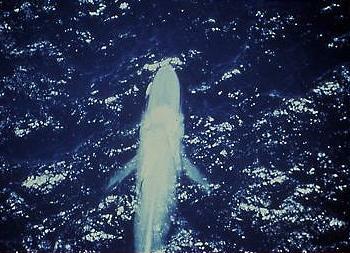 “Recent records of blue whales are very rare from the South Atlantic,” says the IUCN. “Normally, there is talk that the blue whale [population] is growing, but [with this discovery] will be possible to prove with certainty whether that is yes or no,” said Buchanan. At 30 meters (98 ft) in length and 170 tonnes or more in weight, the blue whale is the largest animal known to have ever existed. Buchman said the species remains highly threatened today because fishing is intense, especially in countries like Norway and Japan. “The pressure is too great. These animals need sometimes 10, 20, 30 years to make a calf,” he said. If people kill three-quarters of the species, we will have to wait 50 or 100 years for these whales to recover and there’s no time, because in the next year the killing will continue, he warned. The IUCN says blue whale hunting started in the North Atlantic in 1868 and spread to other regions around 1900 after the northeastern Atlantic populations had been severely reduced. The Antarctic and North Atlantic populations were probably depleted to the low hundreds by the time whaling ceased, but are increasing. Blue whales have been protected worldwide since 1966, although they continued to be caught illegally by former USSR fleets until 1972. The last recorded deliberate catches were off Spain in 1978, according to the International Whaling Commission. Besides contributing to the conservation of the species, the discovery of this blue whale fossil will allow studies of the variation in sea level, says Buchman. “Initially, I thought that the fossil would be 6000 years, because it was when we had a large variation in sea level,” Buchman explains. Once the age of the bone was verified, he concluded that fossilization occurred because of a major natural event, such as a storm. 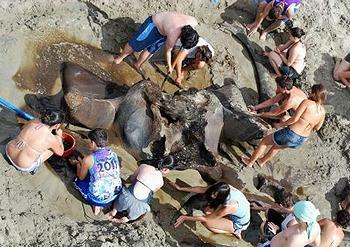 The whale fossil was discovered because today the beach where it was found is rapidly eroding. “Several houses fell, whole streets disappeared. Underneath one of the houses that fell, appeared this whale,” Buchmann said. Since the fossilized whale bones were discovered, the sea has advanced farther and the area where they were discovered is now under water.